With their Alpha out of the country, Charles and Anna are on call when an SOS comes in from the fae mate of one such wildling. Heading into the mountainous wilderness, they interrupt the abduction of the wolf--but can't stop blood from being shed. Now Charles and Anna must use their skills--his as an enforcer, hers as a peacemaker--to track down the attackers..
Glad to be back in the Mercyverse with Charles and Anna again! It has been a while since Patricia Briggs gave us a new Alpha and Omega.... but better late than never, right? Burn Bright's plot is an interesting one. For once, Charles and Anna are with the pack in Aspen Creek instead of having to go somewhere else to "fix" a problem. Charles is in charge of the pack while Bran is out of the country. Then, a distress call comes from the mate of one of the wildings. The couple is under attack and they're asking for the pack's help. Soon, the danger is closer to home and Charles and Anna are in a race to find the answer to the question of Who's behind the attacks on the pack? So who are the wildings? The wildings are the more unstable and older werewolves who need/ have agreed to Bran's protection. They live in isolation from the rest of the pack. Some of them have a past full of pain and misery. There's a reason why Bran offers them sanctuary. However, if one becomes to too lost to his wolf then Bran won't hesitate to take care of the threat. Yet, this time, the threat comes from outsiders and since Bran is not available, Charles will have to deal with the mess. Anna and Charles's relationship keeps on moving forward. Their mate bond is a strong one. They complement each other. Despite Charles being what he is, he's never overprotective. He doesn't overshadow her either. Anna is becoming a much stronger werewolf. She's becoming much more comfortable with her Omega side. She's not a victim and she doesn't want anyone to see her that way. Brother Wolf as always is just great. He can be quite scary but he also brings some needed levity at times. Also, Patricia Briggs let us into a big revelation or at least it was to me. I'm pretty sure I was as clueless as Mercy was/is. Not sure if this information is going to affect the Mercy books. Why bring it up if there is no importance to it? Yet, I don't want Mercy to find out. I love how we get more details in regards to Mercy's upbringing. She was a force to be reckoned with and I'm glad Charles helped her in whatever way he could. Now to the whodunit part....I was with Charles with his suspicion but I was glad I was wrong. Nevertheless, it hurt to see the pack hurting with their losses. Another surprise was Leah, someone who I thought (and might still think) is not the best choice of mate for Bran. Yet, in this installment, she was much more tolerable and even useful. If you don't think so, ask Charles. Asil was one of my favorite secondary characters in Burn Bright. He can be funny but don't underestimate him. He can also be quite scary when he wants to be. He enjoys teasing Charles by using Anna but he loves Anna and would be there to protect her in a heartbeat. 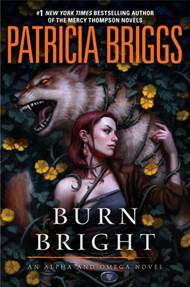 One last thing, the cover of Burn Bright is amazing. Certainly a winner. I do hope we don't have to wait three years for the next one and long live the Mercyverse. PATRICIA BRIGGS DOES IT AGAIN!!!!! I AM OBSESSED WITH HER BOOKS!!!!! With each book, she continues to create unique and dynamic stories with her memorable characters. In traditional Briggs fashion, the mystery and adventure elements of this story were exhilarating. I loved trying to solve the crazy mystery alongside the characters. There were so many unexpected twists and turns, and I enjoyed every moment of it. The storyline of this book is definitely memorable! I was shocked at how much the characters developed in this story. There have been so many books in this world, yet Briggs continues to find new ways to develop her characters even more. Not only did we learn more about Charles and Anna, but we also got to learn more about Mercy. It was such an unexpected and delightful surprise to see some more of Mercy's upbringing. The romance was perfectly placed throughout the story. Charles and Anna had some really sweet moments, but it never overshadowed the intense plot of the story. Their romance continues to blossom and grow throughout each book, just like they do. I SHIP IT SO FREAKING HARD. I don't want to spoil anything about this book, so just do yourself a favor and BUY THIS BOOK! Fans of this series will not be disappointed.